This yarn was hand spun and hand dyed with natural dyes by a small cooperative in Peru. It is 100% alpaca, approximately 100m and the recommend needle size is 5.5mm. This is a Fair Trade item. This luxurious yarn was Canadian milled from our very own alpaca fibre. It is a 3 ply worsted weight yarn made up of 80% alpaca, 10% silk and 10% merino. The approximate yardage is 150 yards per skein. These one of a kind skeins are approximately 50% superwash merino, 40% alpaca, 10% bamboo and/or various other blending fibers. This yarn offers long and gentle colour runs. Each skein has pproximately 106yds and the recommended needle size is 6mm. 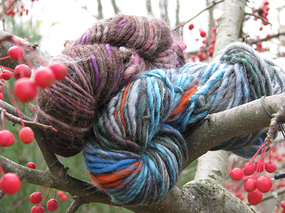 This fabulous handspun yarn is soft and shiny. Knitting up like a bulky yarn; it's great for hats, shawls, scarves, and bags. It has a slightly fuzzy texture. This yarn was hand spun and hand-dyed with natural dyes by a small cooperative in Peru. It is 100% alpaca, approximately 100m and the recommended needle size is 5.5mm. This is a Fair Trade item. This yarn was hand spun and hand dyed with cochineal by a small cooperative in Peru. It is 100% alpaca, approximately 100m and the recommend needle size is 5.5mm. This is a Fair Trade item. This luxurious yarn was Canadian milled from our very own alpaca fibre. It is a 3 ply sport weight yarn made up of 85% alpaca and 15% merino. The approximate yardage is 200 yards per skein. This yarn has some variation in colour as it was made by combining the natural colours of our animals. It is comprised of 80% alpaca, 20% merino with appoximately 25 yds per skein. Works beautifully with 15mm needles to create bulky scarves or throws. It can also be used for arm knitting. This yarn was Canadian milled from our very own alpaca fibre. It is a 4 ply worsted weight yarn made up of 75% alpaca, 10% merino and 10% bamboo. The approximate yardage is 150 yards per skein and this blend would make an excellent sock yarn.